Our three days in Penang were strange but it wasn’t until we got back to Bangkok that we realised all our money had been stolen. 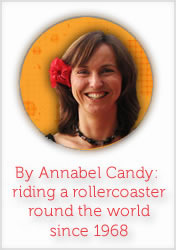 So when the Commonwealth Bank asked me to write about their Travel Money Card I knew I had to tell that story. But first I want to share how you can win a $1,000 CommBank Travel Money Card to finance your own travel adventures by sharing a travel tip. Sounds good? Click here to enter now. Otherwise read on to hear our travel money story and how you can stay safe even if you run into a potential travel money disaster like we did. We were living in Bangkok at the time, staying with friends in a traditional Thai teak house somewhere off Sukumvit Soi. Rich was setting up financial systems for a friend who was managing prawn farms and I was thinking about getting work but not quite sure that Bangkok was the right place for me. Procrastinating, I suppose, and busy studying journalism and Thai although not at the same time. Following in the tradition of many other travellers, we had to leave Thailand on a visa run because our tourist visas were about to expire. The rules may have changed now but at that time you could spend three months in Thailand on a tourist visa, then you had to spend 72 hours out of Thailand before you could return and get a new Thai tourist visa to stay for another three months. We decided to go to Penang in Malaysia on our visa run. It sounded like an interesting place to spend 72 hours and it was. We stayed in a mid-range hotel because we weren’t backpackers living on a shoestring anymore and we were happy to spend more for somewhere clean, safe and comfy. Always security conscious we took all our Australian travellers cheques with us to Malaysia, a huge sum of money that was enough for us to live on for the next six months. As soon as we got to the hotel we did the right thing and put the travellers cheques in the hotel safe along with our passports just keeping out enough money for our three-day stay. Then we hired a motorbike and spend three days whizzing around Penang exploring the city and the whole island. The views from Penang Hill, the colourful street stalls and the snake temple are still seared into my memory several decades later. All too soon our break was over and it was time to get back to the hustle, traffic and pollution of Bangkok. We packed our bags, paid our hotel bill and collected our things from the safe. The staff were efficient and professional but not friendly but we didn’t pay much attention to them. We should have, but we were already thinking of the next part of our journey – getting back to the Thai border and starting the long trip north to Bangkok. So it wasn’t until we got back to Bangkok and needed to cash in more of our travellers cheques that we realised they’d been stolen and that the only place they could have been stolen from was from the hotel safe in Penang. But by then there was nothing we could do except go through the lengthy process of reporting them stolen, waiting for confirmation that they would be replaced and schlepping half way round Bangkok to the offices to pick them up. While travellers cheques are less popular today, credit and ATM cards can and do get stolen or lost. What I love about the CommBank Travel Money Card is that not only is the exchange rate locked in so you know exactly how much money you’ll have for your holiday, but you also get a second CommBank Travel Money Card so if you lose one or it’s stolen you have a backup and your holiday plans won’t be disrupted. Just make sure you keep the back up Travel Money Card in a separate place of course. The CommBank Travel Money Card is like a pre-paid ATM or credit card and, because it comes from one of the most trusted names in banking, lets you access your money confidently worldwide and know exactly how much money you’ve got at all times. Over 35 million locations wherever MasterCard® is accepted. 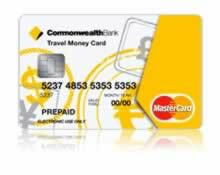 You can buy a CommBank Travel Money Card online (allow five days for delivery), or on the spot from any Commonwealth Bank branch and you can reload it at any branch or, if you’ve already travelling overseas, by phone or BPAY. The Commonwealth Bank is giving away five $1,000 pre-loaded Travel Money Cards this week. To enter all you have to do is visit their blog and share a travel tip with them. For your chance to win visit the CommBank Blog now. To win all you have to do is to share your best tip for people travelling overseas but hurry because the giveaway ends on 5 pm AEST on 05/07/2013. Click here to enter now. This post is sponsored by the Commonwealth Bank in accordance with my disclosure policy. Things to know before you Can: Commonwealth Bank of Australia ABN 48 123 123 124. Call 13 2221 at any time or visit commbank.com.au. Consider the appropriateness of the product. The Product Disclosure Statement and Conditions of Use issued by Commonwealth Bank of Australia ABN 48 123 123 124 for Travel Money Card should be considered before making any decision about this product. Will do because I have a tip or two. I have used these cards and found them very handy, I had two cards ont he one account so the teens could use the money stash too. In fact, I must find them as there might be a few dollars left. That’s already a good tip there about giving them to the kids for their holiday spending money!